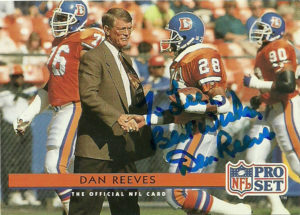 Dan Reeves has had a long and successful NFL career as both a coach and a player. The soft spoken quarterback went undrafted out of South Carolina in 1965. 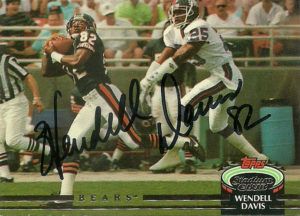 While with the Gamecocks, Reeves posted 2561 yards passing along with 16 touchdowns to 20 interceptions. He also rushed for 815 yards on 359 carries. The Cowboys liked Dan’s versatility enough that they signed him and converted him to runningback. He’d play with the Cowboys for 7 seasons from 1965-1972. His best season came in 1966 when Dan led the NFL with 16 total touchdowns. 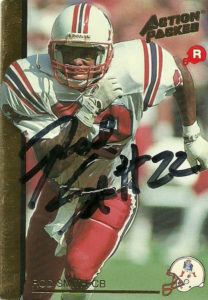 He also had a career high 175 carries for 757 yards, and 41 receptions for 557 yards. After a pretty solid followup season in 1967 (603 yards on 173 carries, 39 receptions for 490 yards, and 11 total touchdowns) Dan would see his playing time decrease thanks in part to a lingering knee injury. In 1972 Reeves joined Tom Landry‘s staff as an assistant coach. 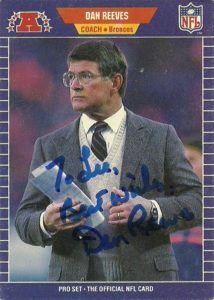 A coveted member of the Dallas staff, Dan attracted the attention of the Denver Broncos who hired him as their head coach in 1981. At the time the move made waves as Reeves was the youngest coach in league history. 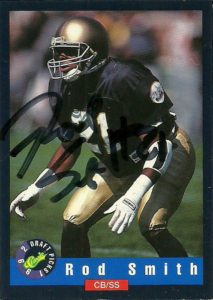 He was given sweeping powers at the time and made shrewd moves that changed the landscape of the NFL. Reeves brought winning ways back to Denver during his 12 years coaching for the Broncos. He identified numerous talent and fostered his own coaching tree. He engineered the trade that brought John Elway to Denver, and the Broncos made 3 Super Bowl appearances under his watch. After a tumultuous 1992, Dan would be fired but quickly found a home with the New York Giants in 1993. Reeves brought many of his former Denver castoffs to New York and rebuilt the franchise from the ashes of the Ray Handley debacle. He earned Coach of the Year honors for leading the Giants to an 11-5 record. 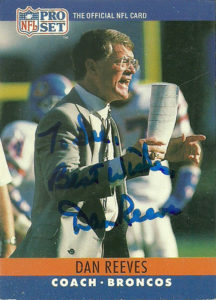 Dan coached with the Giants through the 1996 season. Dan again found a new coaching job with the Atlanta Falcons. After a 7-9 campaign in 1997, he’d lead the team to new heights with a 14-2 record, with the Falcons making their first Super Bowl appearance in 1998, and Reeves again earning Coach of the Year Honors. He’d resign from the Falcons job in 2003, but his name came up constantly over the next 5-7 years for various vacancies. In 2005 Reeves acted as a consultant for the Houston Texans. With the team showing poorly, Dan sat in the owners booth with owner Bob McNair to provide feedback on the coaching and overall organization. After the season concluded with a 2-14 mark, the franchise cleared house. While I would’ve been happy with Reeves coming in as head coach, the franchise opted for Gary Kubiak instead and hired General Manager Rick Smith. 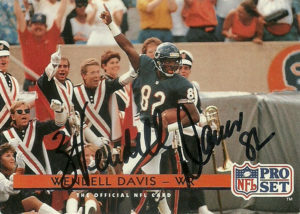 This laid the foundation for the Texans to get to a level of respectability in the NFL. Since that time, Reeves has toyed with the idea of returning to the NFL, acting as a consultant briefly with Georgia State, flirting with the Cowboys as a consultant, and interviewing for the 49ers OC job in 2010. He briefly dabbled in broadcasting and is very personable with his fans. I never really considered getting Dan’s autograph until I came across his ProSet 1992 issue. It’s a great and poignant photo showcasing what a classy guy Dan is. slid slightly out of plastic sleeve, from the envelope. Some moisture was on the cards, but after dabbing them off, they were in surprisingly good condition, and the autographs were not harmed. 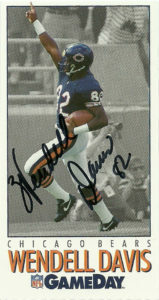 The 1992 Action Packed Rookies & Stars was among my favorites during that early heyday of collecting. 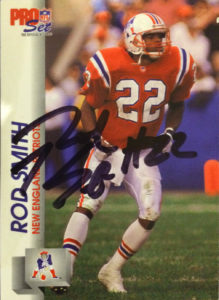 I had already gotten Rod Smith in a Patriots blitz I did in 1992 before the set came out. 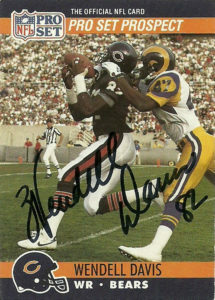 (Back then you could send a stack of cards to a bad NFL team and they’d typically respond by signing most of your stuff.) A great action shot here, I had been wanting to come back and get this one for a while. The ProSet and Classic cards were gravy on top. ProSet still had some nice action photos, sans the bad design and company logo.